Offering one of our most cost-effective archive box solutions, this double depth shelving unit can store up to 72 of boxes. Each shelving bay is built from heavy duty E-Z-Rect Type 1 components that can easily cope with the combined weight of fully loaded archive boxes in both double-depth and double-stack formation. Use this racking system to create practical long term archive storage areas within your workplace. We include the boxes as standard but we are happy to supply the racking alone if you have your own (if this is the case, please take note of the clear-entry shelf sizes shown in the table below to help you decide which size works best with your boxes). 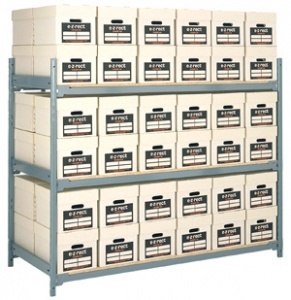 Order as standalone starter bays or extend on from a starter with cheaper add-ons to create long runs of archive shelving. We can help you design a layout that fits perfectly within the space you have available, please contact us for assistance.